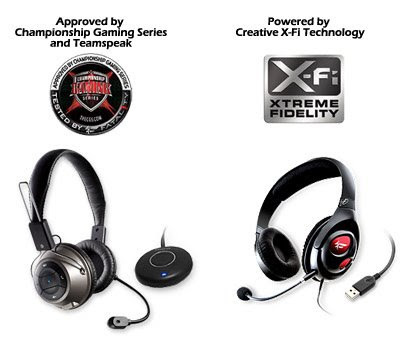 Creative roll out two wireless X-Fi gaming headsets today in the US- the HS-1200 and the Fatal1ty USB HS-1000. Personally I think that Johnathan Wendel and the whole Fatal1ty brand thing is getting abit old and over-rated as I don't see how using a Fatal1ty mouse or headset will make you a better gamer. But I find the HS-1200 a rather promising and exciting product. We first heard of it way back in January during CES 2008, the HS-1200 uses a 2.4GHz radio frequency instead of the widely adopted bluetooth technology. The 2.4GHz is a much more powerful and advance technology that enables you to enjoy undistrupted audio and voice transmission simultaneously up to a range of 22m (72 feet). It can last up to 8 hours per charge and if you run out of juice, simply plug in the cable and continue with your game. It's built-in mic allows you to chat over skype and even has a dedicated button controls for it. Now imagine yourself enjoying your favourite game or music enhanced with X-Fi or chatting with your loved ones over Skype while walking around the house hands free. Or stop imaging and get the latest HS-1200 for only USD$99 (or if you really love Wendel, the Fatal1ty USB HS-1000 goes for a cheaper price of USD$79.99).